so I know I said I’d never ever get one, and I’m probably going to lose all my cool points for this (at least whatever cool points I have left), but the other day we bought at 2008 Honda Odyssey! it is going to be Yvonne’s daily driver. 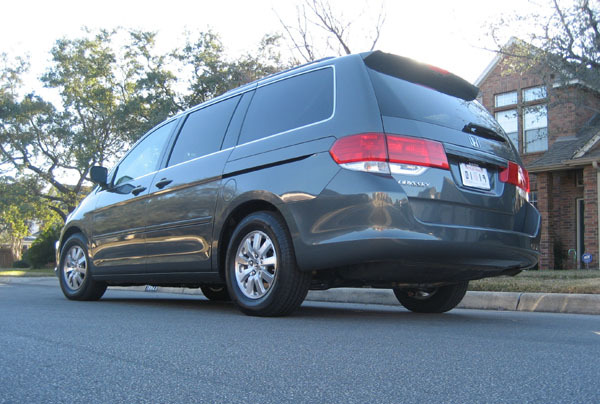 We spent a good deal of time looking into SUVs and also larger sedans, but the third row seat in most SUVs seemed pretty unsafe (too close to the liftgate), and in the end the van was what Yvonne really wanted! I practically had to force her to try it at first, but once she did, she loved the visibility, the smooth ride, and the higher vantage point it offers. Plus, there’s a little camera at the back that shows you what’s behind the van when you’re backing up, which is great when you live in a neighborhood full of kids. 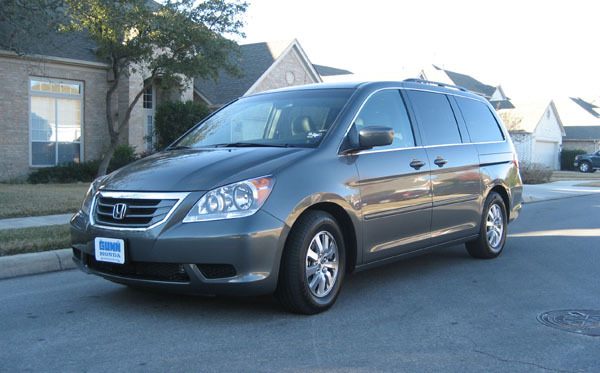 though at first I had my reservations about cruising town in a van, in reality, the Odyssey is pretty pimpin’, with a leather interior, sunroof, three-zone climate control, heated seats, XM radio, and airbags a’plenty. Plus it drives like a car – it’s not truck-like at all. So I’m very pleased that my family will be zipping around San Antonio in something so safe and easy to drive. Suburban lifestyle ftw! this first review I unfortunately am unable to read, as it’s all in German, but it may be the most thorough car review I’ve ever seen. Judging by the pictures they demonstrate all the different ways you can turn on the headlights and also conduct a thorough test of all the doors. As a caveat, I don’t mean to insult the writer of this review, who may truly be an 8th grader who had the gumption to set up his own automotive site, and if so, good on him! If it’s a bot, however – back to IRC with you!